I don’t post very often, but when I do, it’s about my faith, my experiences with all things health and wholeness, and my life as a mom. But today, I am posting about a part of my life I rarely talk about – being a teacher. In order to renew our teaching certificates, every five years teachers in South Carolina have to take a technology course. I hold my National Board certificate so I have ten years to renew my certificate and don’t have to go through the normal process to do so. But I’m still required to take a technology course every five years. Unfortunately, it’s been well over five years since I last took a tech course so I jumped at the chance to take one this semester. There were two course offerings that seemed interesting and I asked God to help me choose one that would actually be worth the time investment. The Connected Educator focuses on Social Media for Educators and since I try to use social media for ministry and life I knew I would use whatever I learned. Honestly, I was just looking to possibly get some hacks on how to effectively use the platforms I’m already using. Instead, I learned some pros and cons regarding educators using social media (both professionally and personally) and best of all my passion for teaching and my interest in blogging was reignited. Totally worth the time investment! I have big plans to flip my classroom – an idea I toyed with years ago but just couldn’t see how to implement it – thanks to EdPuzzle. 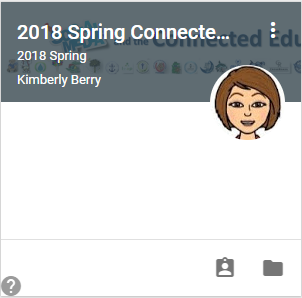 I’ll be able to record my lessons using my SMART Board over the summer (at least through the first quarter) and using EdPuzzle my students will be able to work through the lesson, having to answer questions during the recording in order to advance through it. I am so stoked to be able to use technology in order to flip my classroom. Oh, and as infrequently as I blog, I’ll be adding a new blog dedicated to my experiences as a teacher. Specifically, I’ll be focusing on what flipping my class will look like and the differentiation I’m hoping to do within my classroom because of it. As soon as I work out what the name of the new blog will be I’ll link to it here. Have you taken any course or attended a workshop that has reignited your passion? If so, what was it focused on?